Adorned with giant beasts and topped with a statue of King George I, the steeple of this 18th century Nicholas Hawksmoor-designed English Baroque church is a sight to behold. The unusual spire, which has topped the church since it was completed in 1731, is stepped like a pyramid and was apparently inspired by Pliny’s description of the Mausoleum at Halicarnassus (one of the Seven Wonders of the Ancient World). At its base can be seen four heraldic creatures – two 10 foot tall lions and two similarly-sized unicorns. They’re actually recreations of the originals by sculptor Tim Crawley based on drawings by Hawksmoor. The originals were removed – and subsequently lost – in 1870 amid fears they were about to topple off. It’s suggested that lions and unicorns – which look as if they are in conflict over the crown in the middle – symbolise the tussle for the Crown as seen in the several Jacobite risings which took place in the late 17th and early 18th centuries. 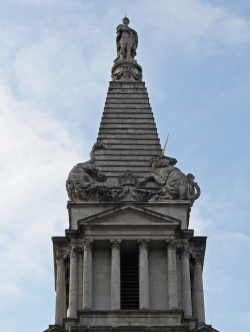 The steeple did prove controversial when it was completed – the church commissioners initially refused to pay Hawksmoor, apparently deeming the spire too frivolous for such a serious building. But it was soon recognised as an important part of the landscape – it can be seen in the background of William Hogarth’s 1751 engraving Gin Lane. In the mid-Noughties, the church and steeple, which had fallen into a state of dishevelment and was apparently on the verge of closure, underwent a major renovation. 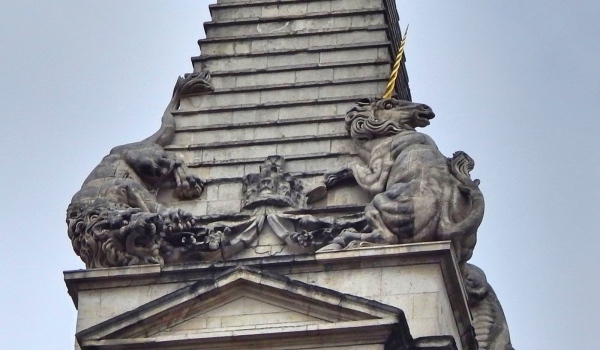 Funded by American Paul Mellon and the Heritage Lottery Fund, it saw the long-lost (albeit recreated) beasts returned to their place on the steeple (the project was recorded in detail by Harris Digital). PICTURE: Right – Amanda Slater (licensed under CC BY-SA 2.0 – image cropped and straightened); Below – Londres Avanzado (licensed under CC BY-NC-ND 2.0 – image cropped and lightened). This narrow City of London passageway which runs between Whitefriars Street and Salisbury Square, just south of Fleet Street, is located in what was the precinct of the former Whitefriars monastery (what later became part of a somewhat lawless area known as Alsatia). 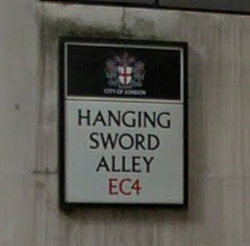 The name of the alley, which can be traced back to the mid-16th century, apparently relates to a hanging sign depicting a sword – hence “hanging sword” – and probably refers to a fencing school (the area was known for them) but it’s also been speculated the name could refer to a public house or brothel. The alley was previously known as Blood Bowl Alley, a moniker derived from Blood Bowl House, a house of ill repute which once stood in the laneway (and featured in a William Hogarth’s Industry and Idleness series, in a plate depicting the Idle Apprentice, betrayed by a prostitute, being arrested). 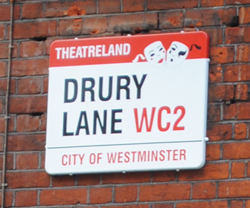 The alleyway does get a mention in Dickens’ A Tale of Two Cities – it was here that he located the lodgings of Jerry Cruncher, the messenger for Tellsun’s Bank who makes money on the side as a ‘resurrection man’. 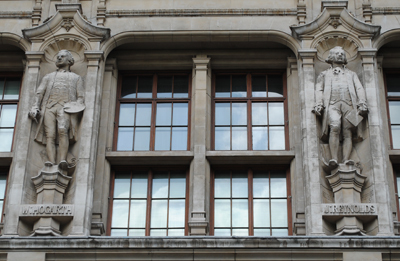 Eighteenth century artists William Hogarth and Joshua Reynolds gaze down from the facade of the V&A in South Kensington. The Victoria and Albert Museum was established in 1852 – capitalising on the success of the Great Exhibition the previous year – and moved to its current site in 1857. 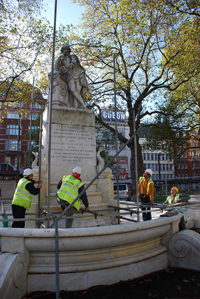 The foundation stone for the current building was laid by Queen Victoria herself in 1899 and it was to mark this occasion that the museum was renamed the Victoria and Albert Museum after the queen and late Prince Albert (although the queen really just wanted it to be the Albert Museum). For more on the V&A, see www.vam.ac.uk. 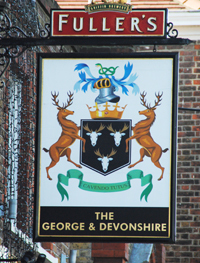 The last remaining pub in old Chiswick village in west London, The George and Devonshire has a history dating back to the 1650s. 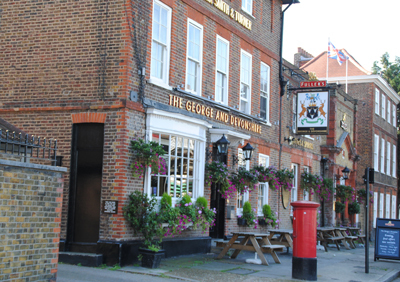 Initially known simply as The George (like so many taverns and pubs, apparently after England’s patron saint), by the 1820s the name had changed to The George and Devonshire – the Duke of Devonshire’s former showpiece property, Chiswick House, can still be found nearby (for more on Chiswick House, see our earlier post here). The coat of arms of the Dukes of Devonshire now hang over the door. The Grade II-listed building at 8 Burlington Lane, which is conveniently located just metres from a Fullers brewery, dates from the 18th century. There was apparently once a secret passageway which led from the pub under the nearby St Nicholas’ Church (burial place of artist William Hogarth) to an opening located among a group of small cottages near the Thames – it is said to have been used by rum and spirits smugglers in the 1700s. The remains of the entrance can still apparently be seen in the pub’s cellar. • The works of famed 18th century chronicler of London, William Hogarth, are on show at the Cartoon Museum in Bloomsbury. Marking the 25oth anniversary of his death on the night of 25th/26th October, 1764, the display Hogarth’s London features more than 50 of the artist’s best known satirical prints including A Harlot’s Progress, A Rake’s Progress, The Four Times of Day, Industry and Idleness and Gin Lane and Beer Street. A series of events – including an evening of Baroque dance & music, gin, beer and cartooning on 28th November – accompanies this exhibition which runs until 18th January and is supported by The William Hogarth Trust. Admission charge applies. For more, see www.cartoonmuseum.org/exhibitions/current-exhibitions/hogarth-s-london. • Nineteenth century Irish political leader Daniel O’Connell has been honoured with an English Heritage blue plaque as his former London home. Known as ‘The Liberator’, O’Connell was an abolitionist who successfully campaigned for civil and Catholic rights – including the right for Catholics to sit in the British Parliament. The first popularly elected MP since the Reformation, he lived in the property at 14 Albermarle Street in Mayfair with his family for several months in 1833 – a year in which a number of his supporters were elected to the House of Commons and in which the act to abolish slavery was given royal assent. For more, see www.english-heritage.org.uk/discover/blue-plaques/. • On Now: Peder Balke. The first ever UK exhibition focused on the paintings of this 19th century Norwegian artist is underway at the National Gallery on Trafalgar Square. Held in conjunction with the Northern Norway Art Museum, the exhibition features more than 50 paintings, the majority of which have never been seen in the UK before. The display includes works from across Balke’s career, including The Tempest (c 1862), the only painting by a Norwegian artist in the gallery’s collection. This free exhibition runs in the Sunley Room until April. For more, see www.nationalgallery.org.uk. • A new permanent gallery looking at how the Royal Navy shaped individual lives and the course of British history over the 18th century opens at the National Maritime Museum in Greenwich on Monday 21st October, Trafalgar Day. Nelson, Navy, Nation charts a course from the Glorious Revolution of 1688 through to the defeat of Napoleon in 1815 and provides a setting for the museum’s many artefacts related to Vice-Admiral Lord Nelson. Among the 250 objects on display in the gallery are the uniform (with bullet hole) Nelson wore at the Battle of Trafalgar, artworks likes William Hogarth’s Captain Lord George Graham in his Cabin, a seven barreled volley gun and grim items like a surgeon’s tools including an amputation knife, bone saw and bullet forceps. There is also the last letter Nelson wrote to his daughter Horatia and mourning rings worn by close friends and family at his funeral. Entry to the new gallery is free. For more, see www.rmg.co.uk. • The first major exhibition dedicated to the American-born artist James Abbott McNeill Whistler’s time in London between 1859 and his death in 1903 opened at the Dulwich Picture Gallery this week. An American in London: Whistler and the Thames features paintings, etchings and drawings produced by the artist and more than 70 objects related to Whistler’s depiction of the Thames and Victorian London. Highlights include Nocturne: Blue and Gold – Old Battersea Bridge (1872/1873) and Brown and Silver: Old Battersea Bridge (1859-1863), the oil painting Wapping (1860-64) and the etching Rotherhithe (1860). There are also a series of portraits of Whistler and his patrons. Runs until 12th January. Admission charge applies. For more, see www.dulwichpicturegallery.org.uk. • Composer Eric Coates has been honoured with the unveiling of an English Heritage blue plaque outside his former home at Chiltern Court in Baker Street. Coates, who created “some of the best known and loved pieces of English light orchestral music”, lived in a flat at the property between 1930-39. For more, see www.english-heritage.org.uk/discover/blue-plaques/. • On Now: Picture This: Children’s Illustrated Classics. This exhibition in the Folio Society Gallery at the British Library takes a look at 10 of the most iconic children’s books of the 20th century – from Charlie and the Chocolate Factory to The Wind in the Willows, Paddington Bear, Peter Pan and Wendy, and The Iron Man as well as Just So Stories, The Hobbit, The Borrowers, The Secret Garden and The Railway Children. On display is at least four illustrated editions or artworks of each title with Quentin Blake, Michael Foreman, Peggy Fortnum and Lauren Child among the artists whose works are being shown. The exhibition also features five specially filmed interviews with four illustrators and Paddington Bear author Michael Bond. Runs until 26th January. Entry is free. For more, see www.bl.uk. • The 2013 Hampton Court Palace Festival kicks off tonight. Highlights include a performance by the Royal Philharmonic Concert Orchestra and fireworks on Saturday night while other artists featured include Jools Holland, Lisa Stansfield, Frank Valli and the Four Seasons, Imeda May, Bjorn Again, Russell Watson, Cliff Richard and Joe Bonamassa and Beth Hart. For the full programme of events over the next couple of weeks, check out www.hamptoncourtpalacefestival.com. • It’s all about good deeds at the Foundling Museum. Opening at the museum in Bloomsbury tomorrow, a ceramic artist Clare Twomey’s exhibition – Exchange: 1,000 Good Deeds at the Foundling Museum – features more than 1,000 cups and saucers with each cup hiding instructions for a good deed underneath. The instructions are only revealed when a visitor selects a cup – they either agree to do the good deed, leaving it exposed and taking home the cup, or, if they’re not able to, can return the cup to its saucer. There is a limit of 10 cups available for exchange each day – ring or check the website for times when the exchanges may take place. Entry is free with museum admission. Runs until 15th September. For more, see www.foundlingmuseum.org.uk. • A memorial ledger stone to former Labour PM, Harold Wilson (later Lord Wilson of Rievaulx), was dedicated in Westminster Abbey this week. Lord Wilson (1916-1995) was PM from 1964 to 1970 and 1974 to 1976. The stone is placed near where Earl Attlee’s ashes were interred at a memorial service attended by Lord Wilson when Prime Minister in 1967. For more, see www.westminster-abbey.org. • On Now: Royal Academy of Arts Summer Exhibition 2013. Coordinated by Royal Academicians printmaker Norman Ackroyd and Eva Jiricna, this year’s exhibition at the Royal Academy in Piccadilly features more than 1,000 artworks with many going on display for the first time. Among the works on display will be Grayson Perry’s series of six tapestries entitled The Vanity of Small Differences – inspired by Hogarth’s A Rake’s Progress, it tells the story of Tom Rakewell. Other highlights include a room dedicated to portraiture – including photographs and works on paper – and a new large scale sculpture by Anthony Caro. Runs until 18th August. Admission charge applies. For more, see www.royalacademy.org.uk. Before Madame Tussaud arrived in London, there was Mrs Salmon and her famous waxworks, one of several such establishments in London. 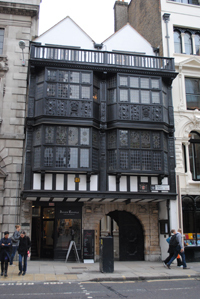 First sited at the Sign of the Golden Ball in St Martin’s Le Grand – where it filled six rooms – in 1711, the display was relocated to the north side of Fleet Street where it remained until 1795 when it moved across the road to number 17 Fleet Street, now housing Prince Henry’s Room (pictured, room takes its name from Prince Henry, eldest son of the king, who died at the age of 18 and was apparently the inspiration for an inn which previously occupied the building called The Prince’s Arms). The waxworks were apparently originally run by Mr Salmon – there are references to him being a “famous waxwork man” – but his wife, Mrs Salmon, continued it alone after his death in 1718 until her own death, variously said to have been in 1760 or as late as 1812. At some point after his death, Mrs Salmon is said to have remarried, to a Mr Steers. Described in a handbill published soon after its initial move to Fleet Street, the exhibitions were said to include a scene of King Charles I upon the scaffold, another of the ill-fated Queen Boudicea, and more exotic tableaux including one showing Canaannite ladies offering their children in sacrifice to the god Moloch, another of a Turkish seraglio, and another of Margaret, Countess of Heningbergh with the 365 children she is said to have given birth to (all at once!). There was also a mechanised figure of the “famous English prophetess” Old Mother Shipton, who is said to have given a boot to visitors as they left. While some accounts say the waxworks – which, according to the City of London website remained at the site until 1816 – were taken over by a Chancery Lane surgeon named Clarke after Mrs Salmon’s death (and by his wife after his death), it is also suggested that at some point they moved to Water Lane in east London where they were ruined by thieves. Whatever its fate, it’s generally accepted that the famous waxworks were visited by the likes of James Boswell and artist William Hogarth. They were also mentioned by author Charles Dickens in David Copperfield. 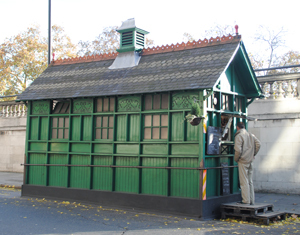 For more of London’s past, see Philip Davies’ Lost London 1870-1945 . 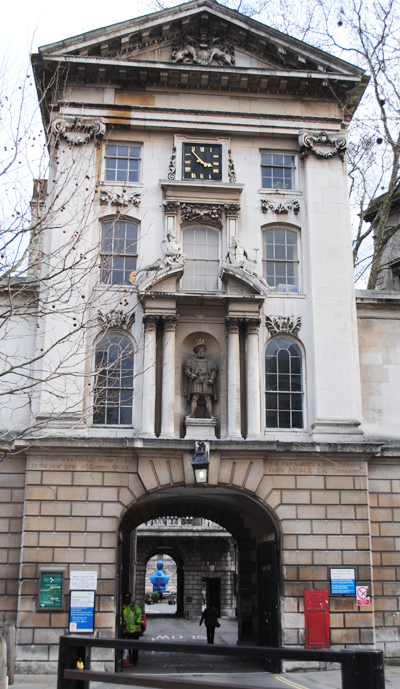 London’s oldest hospital – St Bartholomew’s Hospital in what is known now as Smithfield – was founded in the 12th century. The hospital owes its foundations – like the neighbouring Priory of St Bartholomew (London’s oldest church – see our previous story on this here) – to Rahere, a courtier (possibly a minstrel or jester) at the court of King Henry I who, tired with triviality, may have become a priest. In any event, after the death of Henry’s son William – he is believed to have drowned when the White Ship foundered in November 1120 – and that of his wife Queen Matilda, Rahere went on pilgrimage to Rome. He did so but contracted malaria while there and, while under the care of monks, he vowed to found a hospital for poor men if he recovered. He did recover and on his return journey had a vision of St Bartholomew who informed him that it was he who had helped him to recover and now desired him to found a church in Smithfield (then known as Smedfield). Back in London, Rahere as he’d promised and, after petitioning the king, was granted a royal charter in 1122 to found the priory of Augustinian canons and the hospital.Work began in March 1123 and it was completed by 1145 when Rahere died (his tomb can still be seen in the church). The hospital – one of a number in London at the time – was probably little more than a single hall with a chapel at one end. Other buildings and some cloisters were added later as was the Church of St Bartholomew the Less. Under a charter of 1147, it was open to the needy, orphans, outcasts and the poor as well as sick people and homeless wanderers. In the 14th century, the definition was honed to include the sick until they recovered, pregnant women (until delivery) and for the maintenance of children born there until they were seven-years-old. As well as the master (Rahere was the first), other ‘staff’ at the hospital initially included eight Augustinian brothers and four sisters but the hospital gradually became independent of the priory and by 1300, the hospital has its own dedicated master. By 1420, the two institutions had apparently become completely separate. 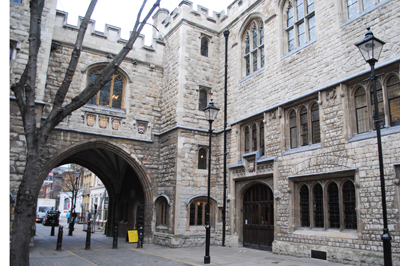 Following the Dissolution in 1539, the hospital was refounded in the 1540s thanks to a deal brokered between King Henry VIII and the Corporation of the City of London. Along with Bethlem, Bridewell and St Thomas’, St Bartholomews was one of four Royal Hospitals administered by the City. The first regular physician – a Portuguese man by the name of Roderigo Lopez – was appointed around 1567 (he was later hung, drawn and quartered for an allegedly plotting against Queen Elizabeth I). Among the most famous physicians to serve at St Barts in later years was William Harvey, renowned for having ‘discovered’ the circulatory system. 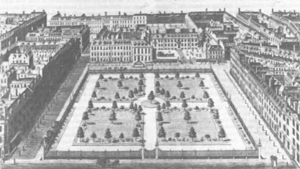 The hospital survived the Great Fire in 1666 but in the 1700s most of the medieval buildings, with the exception of the tower in the Church of St Bartholomew the Less, were demolished as the hospital was rebuilt to the design of James Gibbs. The new design featured a central courtyard with a Great Hall contained in the north wing, reached by a ‘Grand Staircase’ decorated with images of the Good Samaritan and Christ at the Pool of Bethesda by celebrated artist William Hogarth. 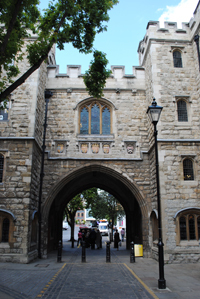 The famous Henry VIII gate (pictured above) dates from 1702, slightly before Gibb’s rebuilding project. Other buildings have been added in more recent times. In more recent times, the hospital was amalgamated with The Royal London and the London Chest Hospitals in 1994 with the establishment of The Royal Hospitals NHS Trust (now known as the Barts and The London NHS Trust). St Barts is now a specialist cancer and cardiac hospital. There is a museum at the hospital which houses exhibits including a facsimile of Rahere’s grant of 1137 (now in the hospital’s archives), amputation instruments dating from the early 1800s once used by surgeon John Abernathy and a display on William Harvey. Hogarth’s paintings are visible from the museum. There are also guided tours of the hospital. 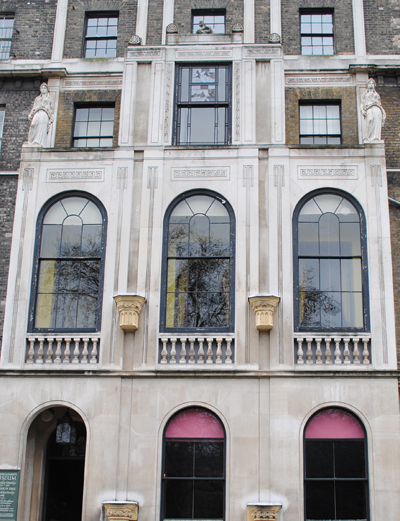 Sir John Soane’s Museum is still unknown to many but that is starting to change as growing numbers of tourists descend upon the property at Lincoln’s Inn Fields (as evidenced by the queues you can now often find waiting patiently outside). The museum is housed in the former home of noted architect and collector, Sir John Soane, who left it to the nation after he died in 1837 by an Act of Parliament with the caveat that it be kept “as nearly as circumstances will admit in the state” it was on his death. Sir John, born the son of the bricklayer in Oxfordshire in 1753, rose to become a famous – and somewhat controversial – architect, his most famous contribution being the Bank of England. Having married into money – his wife, Elizabeth Smith was the daughter of a wealthy builder whose fortune he inherited, Sir John bought 12 Lincoln’s Inn Fields in 1792 and subsequently demolished and rebuilt it. In the early 1800s, he bought the property next door, number 13, and again demolished and rebuilt it, and, in the 182os bought number 14, which received the same treatment, eventually creating the delightfully odd and expansive home which now occupies the site. Sir John was an avid collector of statues, furnishings, paintings and curiosities and the uniquely designed house remains filled with his collections – ranging from the Sarcophagus of Egypt’s Seti I (dating from around 1370 BC) to Sir Robert Walpole’s desk, medieval European stained glass, and William Hogarth’s famous series of paintings, A Rake’s Progress. This is a museum worth visiting for its sheer eccentricity but it should be noted that it’s not really a place for young children – many of the rooms are small and crowded with artefacts that may just prove too tempting.